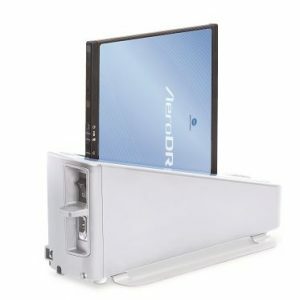 The Clinic has upgraded to the AeroDR wireless digital radiography system, above, where patient information and images appear on one plate. Ron McCrae has seen all three generations of radiography image creation in his career, the last two occurring recently. In 2008, The Clinic moved from film to the digital process of computed radiography, or CR. Three months ago, it began using the most advanced technology in “filmless radiology” – direct-capture radiography, or DR. In the CR system, the technologist had to ID and use separate plates for every image. The technologist then took the plates to a hardware unit where the images were produced before being sent into an archiving system for the radiologist to read. The new DR system is geared toward maximum patient convenience and safety. The DR reduces the patient’s appointment time in half, McCrae said, the speed coming from not having to use separate plates for every image. He said the improved safety comes from the images being produced in a few seconds, reducing the radiation dose patients receive by half compared to the older CR tools, which already had very low exposure levels. McCrae also said the DR produces higher quality images, which makes image defects less likely, reducing the need for repeat scans. The Clinic has seven plates in all, five at the Imaging Department in the Asbury Building in Corvallis, and one each at Philomath Family Medicine and at Waverly Drive in Albany.